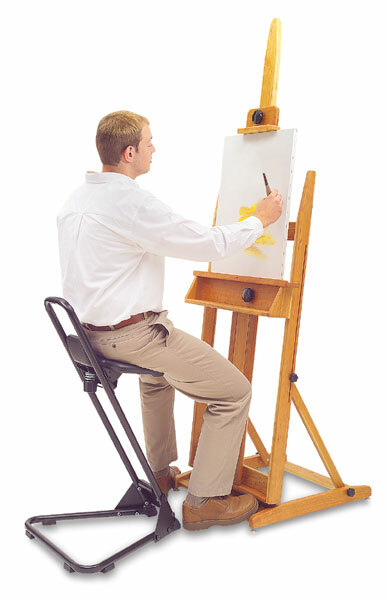 This stool can make you more productive.You won't have to stop work and walk around when your limbs get stiff during long work sessions. Safco's Stand Alone Stool dramatically reduces worker fatigue by bringing unmatched comfort and stability to any standing or partial sitting activity, including drafting, painting, framing, filing, and much more. It makes working while standing more comfortable! The large contoured seat, constructed of black polyurethane foam, is easy on those sit bones and tail bone. It offers lower back support and a waterfall front. Adjust the seat in height from 21" to 35", and tilt it forward up to 15°, to find the most comfortable working position. Other features include a built-in foot rest and rubber anti-skid feet. To view a PDF of the Warranty for the Safco Stand Alone Stool, please click here. ® Safco is a registered trademark.